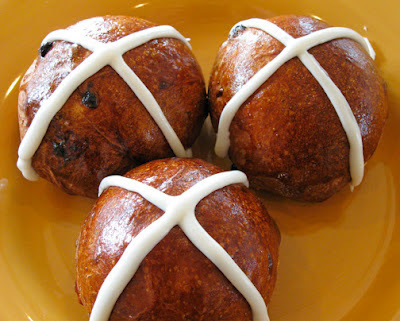 Buttercloud Bakery and Cafe: Hot Cross Buns! Share a Hot Cross Bun with a friend to ensure friendship throughout the year. In anticipation of the upcoming Easter holiday we will be offering Hot Cross Buns! These sweet buns are filled with raisins, currants and spices and topped with a white frosting cross. They are traditionally eaten on Good Friday but they taste just as good on the other six days of the week! Stop in to get a couple for work or call us a day in advance if you'd like to order a larger amount for your Easter celebrations (541-973-2336).